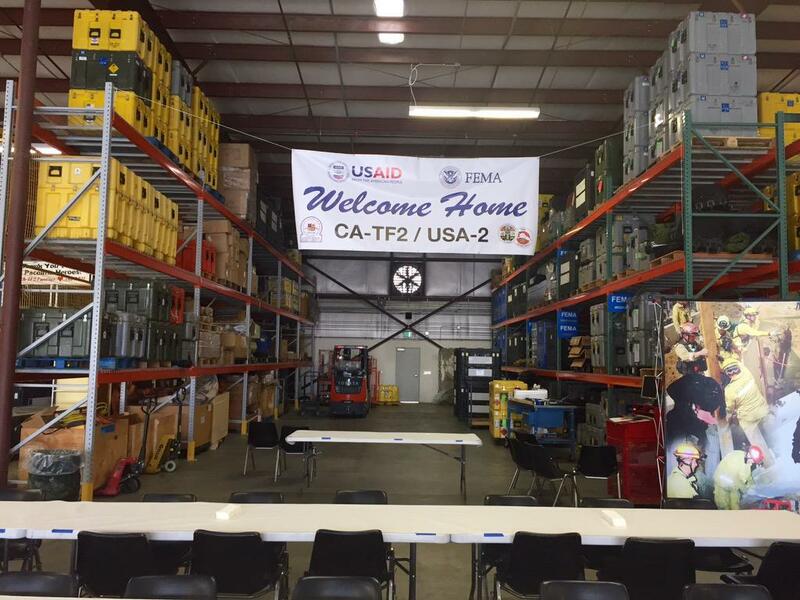 Los Angeles County firefighters who went to Nepal to aid in the aftermath of the devastating 7.8-magnitude earthquake there began returning home Friday, officials said. 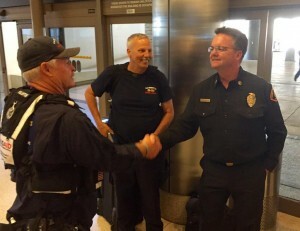 A team of 57 specially trained L.A. County firefighters that make up the USA-2 Medium Urban Search and Rescue Team rushed to help effect rescues and help restore order following the massive earthquake that killed more than 8,000 people, Los Angeles County Fire Department officials said. The team is one of only two in the nation qualified for such overseas missions. The team helped rescue a teenage boy who was found buried alive in rubble four days after the earthquake, officials said. The firefighters began arriving home via LAX Friday afternoon before heading to their home base in Pacoima, fire Capt. Keith Mora said in a written statement. The rest were expected to arrive by the end of the day Saturday. FULLERTON — The majority of Fullerton homes red-tagged by authorities following Friday night’s earthquake were inspected and cleared for residents to return early Sunday, as aftershocks as strong as magnitude 4.1 continued to rumble the La Habra area, officials said. More than 100 aftershocks had been reported since Friday’s 5.1-magnitude quake. A 2.7-magnitude aftershock shook the Southland at 9:05 a.m. Sunday. And a magnitude 4.1-quake was widely felt Saturday afternoon. But there were no new reports of damage in Fullerton, where 20 apartments and six homes were initially deemed unsafe to inhabit, Fullerton police officials announced in a written statement. “Of the residences that were originally red-tagged, residents in the 20 apartments on North Associated have been allowed to return to their residences, after structural engineers cleared the properties for re-entry,” according to the police statement. Six houses within the city remained red-tagged, officials said. LA HABRA >> A magnitude-5.1 earthquake centered 2 miles east of La Habra late Friday rattled buildings and ruptured gas lines throughout Los Angeles County, officials said. The quake was reported at 9:09 p.m. according to data from the United States Geological Survey. The shaking originated about 5 miles underground. The 5.1-magnitude quake was followed two minutes later by another quake of magnitude 3.4, officials said. Reports of natural gas leaks began flooding in to officials once the shaking stopped, Los Angeles County Fire Department Dispatch Supervisor Ed Pickett said. “We’ve got reports of lots of gas leaks in the Rowland Heights and La Habra areas,” he said. As firefighters made their way through the affected areas, they found the leaks to be minor, Pickett said. Most were in La Habra. But a broken water pipe flooded a CVS Pharmacy along Nogales Street in Rowland Heights, he said. Authorities were still working to assess and attend to the damage, Pickett said. The earthquake sent rocks tumbling onto the Holt Avenue offramp of the westbound 10 Freeway in Covina, creating a traffic hazard, according to CHP officials. No other earthquake damage had been reported to the CHP late Friday. Shengzao Chen, a USGS geophysicist, said his office had not heard of any immediate damage or injury reports. There were more than a dozen aftershocks following the 5.1 magnitude quake, with magnitudes as high as 3.6, according to the USGS. Claremont police Lt. Shelly Vander Veen said there was no reported damage on Friday night in Claremont. “We felt the same thing everyone else will say — a jolt,” Vander Veen said. 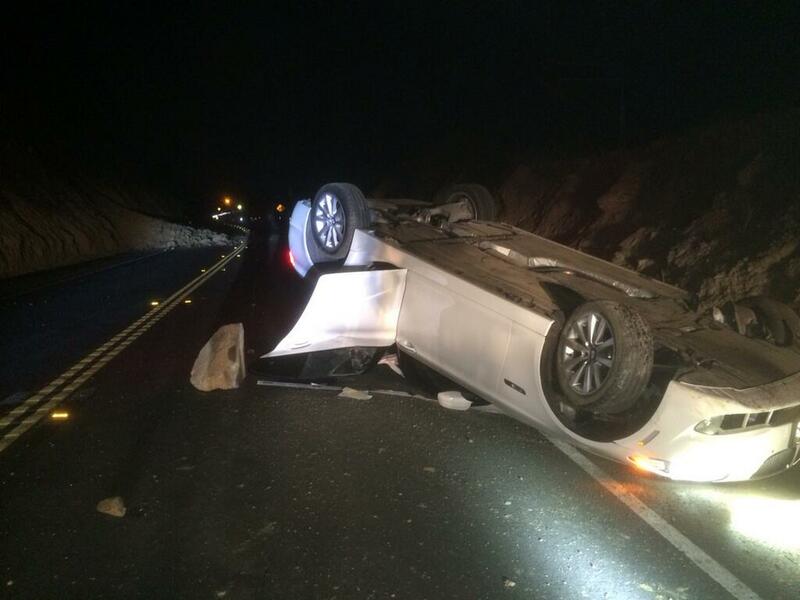 A rockslide Carbon Canyon Road in Brea caused a car to overturn, causing only minor injuries, Brea police officials said. The road was closed between Valencia Avenue and the county line as officials cleared the mess. Southern California Edison officials reported about 2,000 customers were without power late Friday as a result of the earthquake. Officials in Pasadena surveyed the city following the quake and found no signs of injury or damage, Pasadena Fire Department officials said. The larger quake was preceded by a magnitude-3.6 earthquake reported in the same area, about 1 mile southeast of La Habra, according to seismologists at Caltech in Pasadena. In a statement issued late Friday, Los Angeles Mayor Eric Garcetti said no damage had been reported in the city. The smaller tremor occurred at 8:03 p.m. with an epicenter about a mile southeast of La Habra, according to a statement issued by Caltech. That quake’s depth was initially reported to be about 4 miles below the surface. Looking forward, seismologists estimated the likelihood of another quake stronger than the original 5.1-magnitude shock over the next seven days at 5 to 10 percent, according to the USGS. “Most likely, the recent mainshock will be the largest in the sequence,” the agency said in a written statement. The chance of “strong” aftershocks — those with a magnitude of 5 or greater — over the next week was estimated by USGS seismologists at 10 percent. Aftershocks with magnitudes ranging from 3 to 5 are expected to be relatively common over the coming days. “Approximately three to 20 small aftershocks are expected in the same seven-day period and may be felt locally,” according to the USGS statement. Like thousands of people in Haiti and the U.S., Azusa Pacific University nursing professor Pamela Cone wondered what became of her family in Port-au-Prince. “My extended family lives in the city and there is no news on whether they survived,” Cone said. Born and raised in Haiti by her missionary parents, Cone serves on the board of directors for North Haiti Christian University and travels to the country at least once a year to visit her sister and brother-in-law, who is the president at the college. Cone’s sister and brother-in-law survived the quake, but there is no word on whether her nieces, nephews and other extended family members made it through the natural disaster. Cone voice cracked when she thought of the devastation in the country she still calls home. How you can help, the latest news and quake maps via Google. 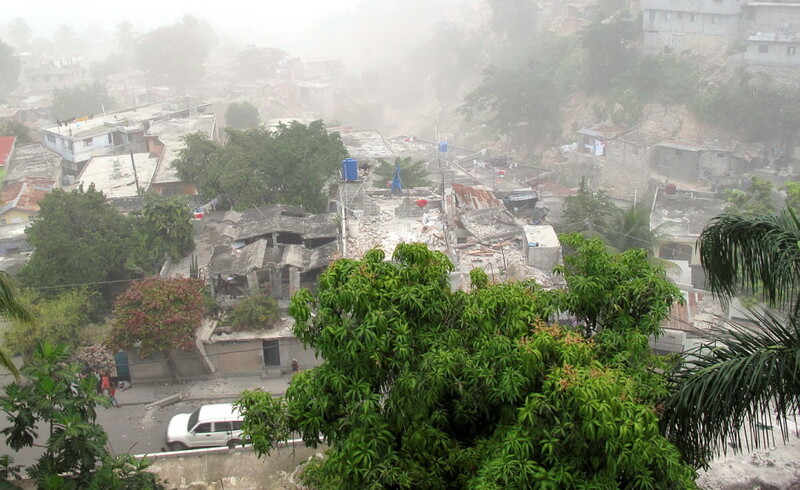 All Hospitals have collapsed and Port Au Prince’s main prison is destroyed – all surviving inmates have escaped. Search and Rescue teams from Los Angeles County and en route to help out. This comes from an account of the Spanish exploration of California under Gaspar de Portola, the first governor of California. Father Crespi later wrote that at that very moment a violent earthquake struck and the river was thus proclaimed Rio de Los Dulcime Nombre de Jesus de Los Temblores. The earthquake history of California serendipitously begins with the first overland expedition through the State in 1769. In response to the perceived threat posed by Russian expansion into the northern Pacific and growing British presence in the northwestern Pacific, Spain embarked on the colonization of present-day California through the establishment of a series of Franciscan missions, supported by military garrisons at San Diego and Monterey. In the summer of 1769, Gaspar de Portola led the first expedition from San Diego to establish a land route to Monterey. From the diaries of three members of the expedition, we know that earthquakes were felt on nearly a daily basis through August 3, as the party traveled northwestward to near San Gabriel and then westward across Los Angeles to the Pacific. The diary of Fray Juan Crespi (Bolton, 1927) mentions no fewer than a dozen aftershocks, some described as violent. After August 4, no further earthquakes were mentioned as the expedition traveled into the San Fernando Valley and exited to the north.